Red Line trains will run every 6 minutes and Purple Line trains every 12 minutes. Expo Line trains will run every 6 minutes. Blue Line trains will run every 6 minutes between 7th Street/Metro Center and Willow Station. Gold Line trains will run every 7 minutes between APU/Citrus College and Union Station, every 15 minutes between Little Tokyo/Arts District and Atlantic Station. Green Line trains will run every 12 minutes. The starting point for the march is outside the Red/Purple Lines’ Pershing Square Station. If you were an attendee from previous years, you may recall the extremely long lines at TAP vending machines. You can bypass that by buying and loading your TAP card ahead of time. 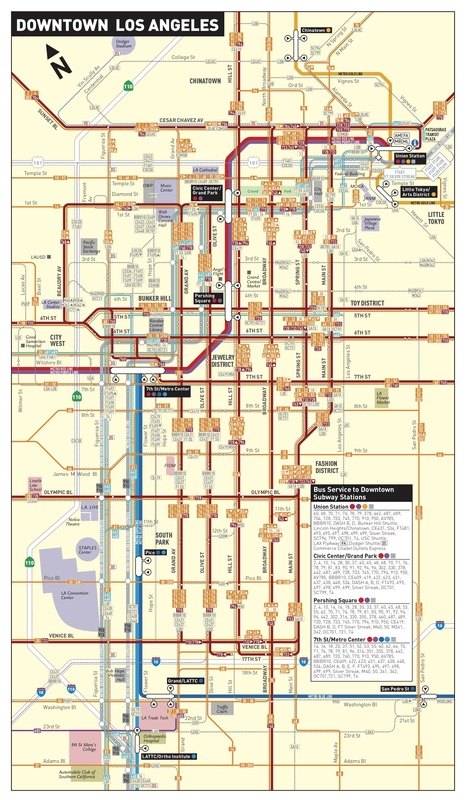 Buy TAP cards and load fares online at taptogo.net or at any Metro Rail or Orange Line station; here’s a system map. Roundtrip fare is $3.50 in stored value and a Day Pass is $7. Please note: each person must have their own TAP card. Two children under age 5 may travel free with each fare-paying adult. •DTLA is served by five Metro Rail lines: the Red/Purple Line subway, the Blue Line, Expo Line and Gold Line. If you’re planning to park and ride, here are your options. •As the march takes place, DTLA buses will be in service but will be on detour due to street closures. If you are traveling by bus, Metro lines 2, 4, 10, 18, 28, 55, 62, 81, 83, 90 and 94 will bring you as close as possible to the march’s starting point. 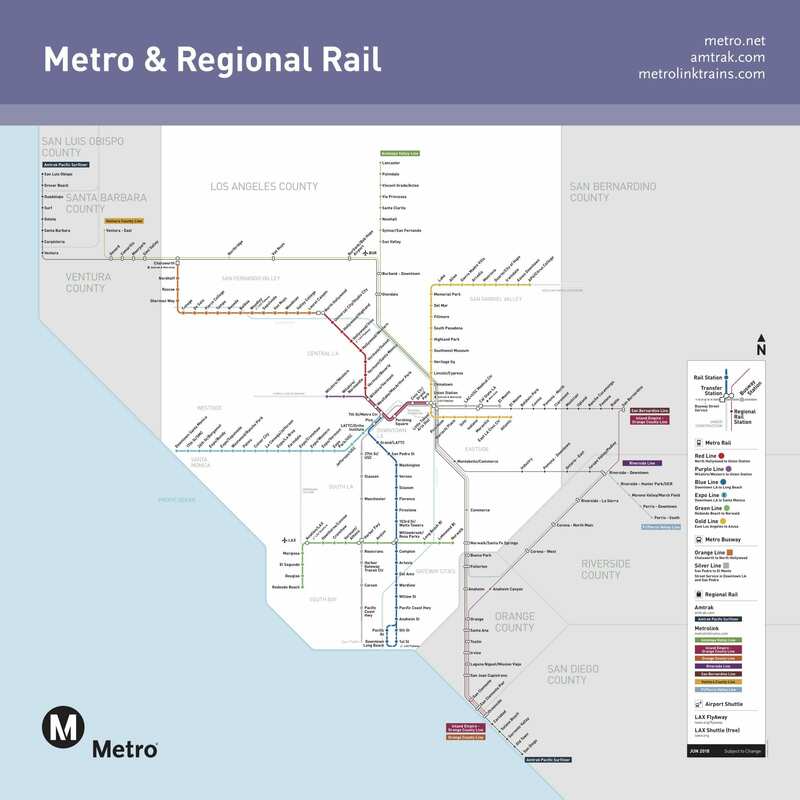 We will provide live updates on service detours and park and ride availability on Twitter at @metroLAalerts. •If you’re coming in from further away, Metrolink may be an option. Metrolink will be running additional train service to Union Station in DTLA on the Antelope Valley, San Bernardino and Ventura County lines. Regular 91 Line service will also allow people to reach the march before its scheduled start. From there, you can use your TAP-enabled Metrolink ticket or mobile ticket QR code to transfer for free to the Red/Purple Line to reach your destination. Please check Metrolink’s website for details on schedules. Metrolink weekend day pass tickets are $10. 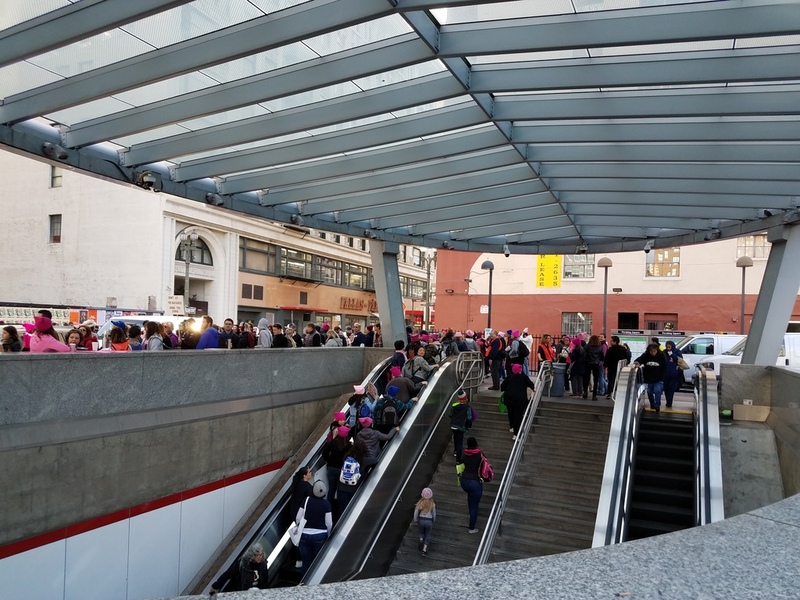 •To keep passenger flow moving at Pershing Square Station: the 5th/Hill portal will be ENTER ONLY during the march. The 4th/Hill portals will be EXIT ONLY. ADA customers/strollers may use the elevator at 5th/Hill in both directions. •Please use the entire platform when boarding Metro Rail! For everyone’s safety, Metro staff will be monitoring crowd levels at rail stations and adjusting service as needed. And, as always, please be careful around buses, train platforms and train crossings. If walking through rail crossings, obey all signals and safely cross the tracks.